Converts manually operated interior table lamps to dusk-to-dawn lighting. Plug the control into any interior 120 volt outlet. For incandescent loads only. Designed for indoor or outdoor use and has a small profile that fits into most table lamps or outdoor post lanterns. 120 volt with a range of 105-130 volts, 150 watt tungsten load rating. Indoor/outdoor dusk to dawn light control for incandescent bulbs. Fixed light shutter. 150 watts maximum. Plastic housing. Screw-in connection. 2.2" x 1.5" x 1.5". Candelabra light control. Turns incandescent candelabra based light bulbs on at dusk, off at dawn. Spring loaded contact allows for proper sensor orientation. Simulates home occupancy, ends coming home in the dark. 60 watts maximum. Plastic housing. 1.85" x 1.4" x 1.4". Outdoor/indoor programmable light control for incandescent/CFL/LED bulbs. Medium base light control screws into the fixture, bulb screws into control. Programmable off timer from 2, 5 or 8 hours, plus dusk to dawn settings. Random off timer deters intruders. Contact plunger allows sensor window to change direction. Digital microprocessor for full brightness and no flicker operation. 100 watts maximum. Plastic housing. Screw-in connection. 3.3" x 2.16" x 2.16". Programmable light control with a single dial that allows users to see what setting they have selected. Choose how long light stays on after dusk, 2, 5, 8 hours or until dawn. Micro-processor intelligence helps determine more accurate off-time in the morning. Random off option deters intruders. Outdoor use with rain tight fixture. Do not use with opaque or frosted glass fixtures. Contact plunger allows optimization of the sensor window direction. 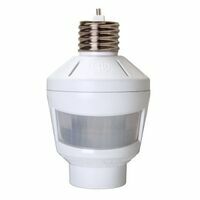 Works with incandescent, compact fluorescent and LED bulbs, 100W max bulb upward, 60W max bulb downward, 120V, 60Hz. Plug in a lamp for 4-in-1 wireless control. Select all day motion, night time motion, dusk-to-dawn or random. Great for hallways, entryways, basements, bathrooms and more. Compatible with LED, incandescent, and CFL bulbs. 10A, 1200W resistive.